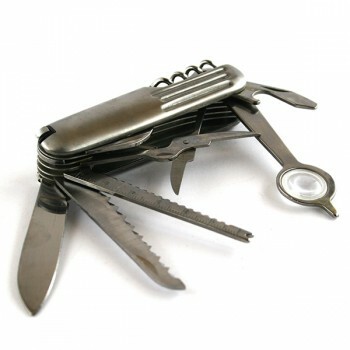 Pocket sized utility tool with the multitude of screwdrivers, knives, scissors and useful appliances that have made Swiss Army knives famous. We can engrave your logo onto the casing, or create custom printed packaging so that this interesting corporate giveaway projects your image and reminds your clients of you every time that they use it. Other items that prove popular for purchasers of this gift include our Miniature Flashlight, the Custom Printed First Aid Kit, or for those that are outdoors a lot – a custom embroidered baseball cap provides the option of your company branding in a fun and interesting way.